Full of heart and hope, The Florentine Bridge is a tear-jerking read for those looking for an Under the Tuscan Sun-inspired setting. Vanessa Carnevale is an author and freelance writer based in Melbourne, Australia, where she lives with her husband and two children. In her early twenties, Vanessa spent several years living in Florence, Italy, where she met her husband and discovered a love of travel and la dolce vita. She now considers Italy her second home. The Florentine Bridge is her first novel. Life's challenges, tragedies and undying love in a timeless setting. Could not put this delightful story down. Loved every second. The Florentine Bridge was beautifully written. The backdrop of Florence was perfect. For me personally, Italy has always been a hot button. I have always wanted to go, learn the language, eat the food and just live like they do so this book was incredibly easy for me to power through. I couldn’t put it down. Part of me didn’t want to finish the book purely because I was so in love with the setting. The characters were wonderfully written, realistic, emotional and loveable. From Mia to Silvio, I fell in love with every character. This book had me reevaluate how I look at life. It is an excellent tale of how to live in the now. Don’t let anyone tell you the odds; odds are insignificant in the face of hope and faith. The characters in this book definitely prove that anyone can overcome the odds. I loved the unpredictability. I thought I had guessed what was happening and then things turned and I was left stunned. This book has everything for a good read! If your ideal novel is one that is painted with vivid descriptions, and a beautiful love story that has you invested from the word go, then The Florentine Bridge is for you. 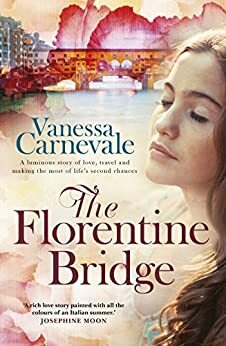 The debut novel from Australian author Vanessa Carnevale, is a captivating love story set against the backdrop of the gorgeous Tuscan skies of Italy. Nineteen-year-old artist Mia, has packed her bags and paintbrushes to start afresh in a small village on the outskirts of Florence. Thousands of miles away from her family back in Melbourne, Mia, now in remission from cancer, is intent on trying to get her life back on track and be inspired to pick up her paintbrushes again. But, it is a lot harder than she thinks. Self-doubt and fear consume her every thought, and even the beautiful Tuscan scenery doesn’t seem to be helping. That is, until she meets Luca. What unfolds is a heart-warming, intimate love story that takes the reader on a chauffeured voyage of the glorious landscape of Florence, and it’s surrounds. It is both delicate and heart-breaking as the two lovers battle their own inner demons tearing them apart, and threatening to break them altogether. What I loved besides the magnificent way Vanessa paints the scenery, was the internal thoughts of Mia. Her fear, her frustrations, and her realisations, were handled delicately allowing the reader to invest in her story. Mia’s character development and arc were beautifully formed, and we can see her grow from beginning to end. Vanessa has been able to put every emotion into her characters, and it is tenderly transferred from author, to character, right through to reader, making for a glorious emotion-filled read. The story was so beautifully written and portrayed, that I didn’t want it to end. Now I want to learn to paint and travel to Italy! Vanessa has written an emotionally engaging and evocative tale of romance and self-discovery. The vivid descriptions of Italy and painting drew me in and the slow burn romance kept me turning pages. I really connected with Mia - I felt like I got right inside her head. And Luca **swoon** I could listen to him talk all day long. A fabulous debut from Vanessa - I'm looking forward to reading more of her work. This is a stunning debut novel that's emotional, evocative and touching. The love story between Mia and Luca is wound-up and entwined with Mia's love of Italy, and her exploration of self and identity. At times I found this difficult reading as a close family member had similar cancer treatment to Mia's in the story, but I also adored the vivid depiction of Florence and could identify with Mia's journey. Highly recommended, and I want to read it again.